Ever since I read Italo Calvino’s Invisible Cities (1972) and David Eagleman’s Sum (2009), I’ve been interested in magical realism — a playful, imaginative curiosity that, lately, has even snuck into my own writing. Shortly after reading their work, it did not take long for me to find Jorge Luis Borges and Alan Lightman (whose Einstein’s Dreams I reviewed last year). Lightman’s perspective on the genre I’ve particularly enjoyed given his background as an MIT physicist. So, I was excited when, once again prowling the stacks of Half Priced Books, I came across Mr. g: A Novel About the Creation (Vintage, 2012). To be blunt: I have mixed feelings about it. Sadly, though, (to compromise my authority as an unbiased reviewer) I’m emotionally incapable of being too critical. You see, I once wrote Lightman a letter asking him to contribute to my blog Giraffes Drawn By People Who Should Not Be Drawing Giraffes. And he did. What a sweetheart. I can’t just sink a relationship like that. Mr g is a first-person-except-when-it’s-not narrative about God’s creation of the universe (or rather a universe). Tolerating the squabbles and input of his Aunt Penelope and Uncle Deva, Mr g introduces space and time to “The Void” (the non-dimensional realm they inhabit), deciding thereafter to create a universe merely to keep himself occupied. Beginning with a few “organizing principles” (natural laws), he spends most of his time fawning over the harmony of the cosmos’ as they effectively create themselves. In the book as in nature, it is rules that govern and build not a spirit’s hands. Thus emerge stars and the fusion of basic elements to create more, which in clicks of the atomic clock form the richness of planets, solar systems, galaxies. 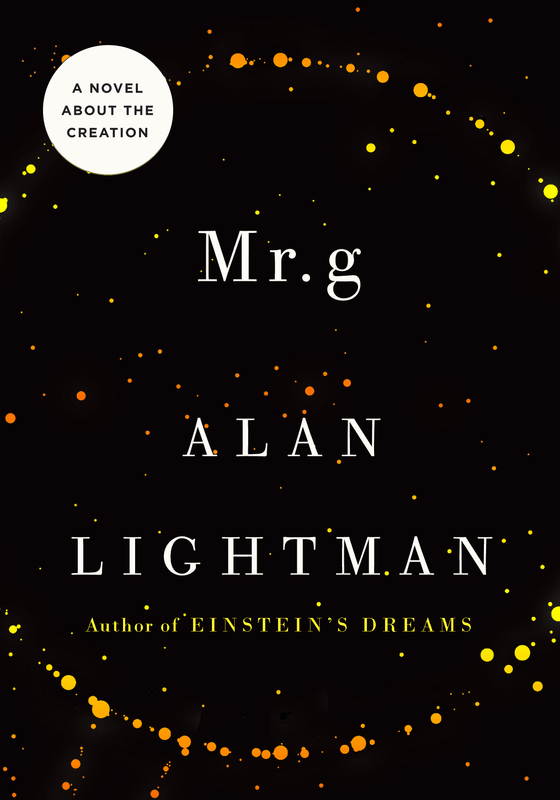 The way Lightman lays out this natural progression — leading to the emergence of life — was where I found his prose most engaging. Unfortunately, when this life becomes intelligent, moral, that’s when the writing becomes clumsy. As Mr g quickly discovers, his act of changing the Void, creating something from what was literally nothing, led to the emergence of other trans-dimensional creatures: Belhor and two mischievous demons named Baphomet the Larger and Baphomet the Smaller. At different times in the universe’s development, they appear to discuss with God the nature of good and evil, principles versus loyalty, and so on. Each dialogue ends with Belhor commenting how great and clever his intellectual equal (God) is. As a reader, though, these are no more than mere assertions because at no point in the dialogues are these qualities evident (in either himself or God). In fact, they read like the grandstanding of two college freshmen who read the Wikipedia entry on Aristotle for the first time. I’ve heard it before. Most readers, I’m sure, will enjoy the book — if you have a passing interest in science and enjoy the colorful, scientific prose of Sagan or Neil deGrasse Tyson, you’ll enjoy it. (Though like all physicists and cosmologists, Lightman is not immune to saturating his text with the words “harmony” and “order” between references to classical music). The book’s merits don’t come from the strength of its named characters; instead, the only character who mattered to me was not the creator but the created: the universe. In 214 pages we witness the cosmos’ birth, life, and, in several beautifully-written chapters, its death. If you read Mr g, ignore the talking in the background: watch the show. This is a novel about creation after all.